The souls of artists and philosophers are never still; their vigilant senses are buffeted by the urgently calling winds and tides of change that they often detect before others. As such, some artists serve as the most honest of social critics. The current exhibit filling the South, Annex, and Brackett Clark galleries of George Eastman House is a photographic installation by Los Angeles artist Lauren Bon and her Metabolic Studio Optics Division. 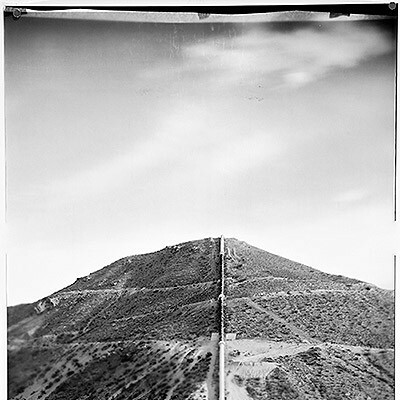 The project links ravaged lands in Southern California with the historic photographic industry of Rochester, as they are connected by the resources of silver and water. In the 1800's, westward expansion in the United States was underwritten with the promise of silver (and other prized minerals) being mined in the California hills and mountains, some of which was used to save the ailing U.S. economy. Some of that silver was used in the development of film at Eastman Kodak in Rochester, which was then shipped back west to build the emerging Hollywood industry. "In the great American West, photography found a perfect subject: vast spaces and uncharted vistas were recorded in grains of silver," says Bon in a provided statement. "In the form of postcards, broadsides, and railway brochures, each image became a silver promise. Photography traveled west, and people followed." Like many cities, Los Angeles sprang forth from the fountain of resources located nearby. Just as Rochester's boomtown status was due to the river and waterfall that we now often take for granted, L.A.'s existence is owed not only to the silver screen, but also to the water running through the L.A. Aqueduct, drawn from many miles away. But as resources deplete, lands are left ravaged, and technology leads us in new directions, we stand between the thin vein of the known past and the wide-open mouth of the deep unknown. Since late 2010, Bon and her team — including artists and technicians Josh White, Rich Nielsen, Tristan Duke, and Guy Hatzvi — have returned to the relevant sites of this story of silver and water to bear witness to abandoned and used-up resources. They have traveled from the desiccated Owens Valley, formerly the site of the lake from which L.A. drew its water; to Rochester, where the silver was turned into photographic material; to Manhattan, America's financial artery; and to Washington D.C., where flags are flown above forsaken soldiers. The Eastman House exhibition includes 18 large-scale photographic prints produced in these locations by Bon and the Metabolic Studio Optics Division, one video of a 16mm film, and one installation of two negatives immersed in water that Bon says will transform over the course of the exhibition. The prints are a product of the Liminal Camera, a gigantic pinhole device made out of a 20-foot-long shipping container. The camera is aptly named in that it not only documents relevant spaces on the threshold of a new trajectory, but in that it is a device that the crew actually trucks around the country, traveling and working within the camera itself, where these images take shape. Upon entering the South Gallery, visitors encounter five mammoth prints. The haunting works depict idyllic, rolling hills and railway tracks along the New York waterway. In the center of the room is an installation of two negative prints immersed in a shallow bed of water held by 2"x4"s and a sheet of black plastic. Bon and her team brought the Liminal Camera to Rochester in October 2011 to photograph Kodak while it was declaring bankruptcy. 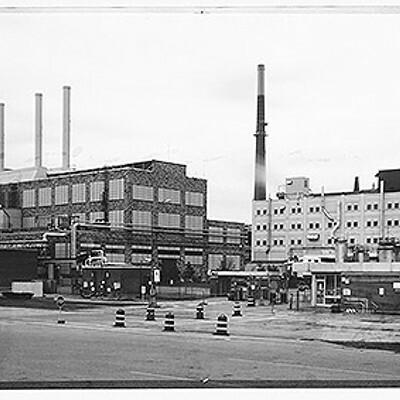 The double negative immersed in water is an image of a chemical processing plant, part of which is no longer standing. "During the life of this exhibition, we will be re-mining the silver from this image," says Bon. Returning visitors will notice minute changes in the paper as the emulsion loosens, disintegrates, and the image begins to change. "You'll start to see the component parts of photography as elements, suspended in silver and water," she says. The team will return to Rochester in May, when the tiny "pond" has completely dried out, and make a contact positive from this work as a performance component of the piece. The ritualized activity seeks to serve as a "catharsis in the house itself," says Bon, at a time when photography must move into the next phase of development. The print will hang at Eastman House in May, and silver will be mined from the bath and reused. Bon and her team are interested in the reinvention of what photography can be in the rapidly changing commercial photographic world, which leaves the field open for a redefinition in the face of digital, she says. The action echoes the team's work in California. In the Brackett Clark Gallery hang images of the dry Owens lakebed, with hills containing abandoned silver mines standing like tombs in the background. During the process of creating "A Three Day Shoot Out," the film currently showing in the Annex Gallery, Bon realized that her interest was shifting from filmmaking to the process of making film. 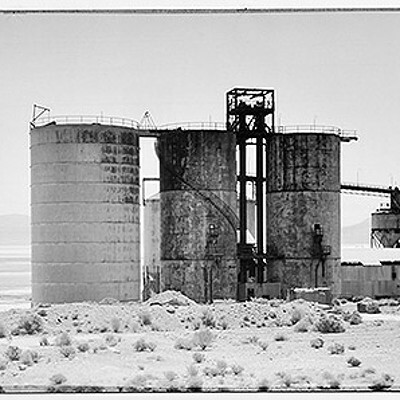 The artist and her team have taken over the silos at the Pittsburgh Plate Glass company on the dry Owens lakebed, and have begun to excavate their own materials for making film using silver from the abandoned mine and sourcing gelatin from the bones of deceased ranch animals. Bon is making prints of the desiccated landscape using materials from the landscape itself. Liminal prints of artificial waterways on both coasts are included, contrasting the L.A. Aqueduct pipeline as if it were already a ruin, says Bon, and the Erie Canal, both markers of human industry and need, which act as visual white noise cutting across the spaces between settlements. These are our Egypt, says Bon. On the other side of a dividing wall, images of the destroyed California landscape reveal a dusty terrain, which has created airborne toxins that prompted a the enforcement of federal air quality regulations to refill part of the Owens lake. Bon also indexed this pitiful and nearly abandoned project in a print that reveals a sad, swirling mess of shallow silica sludge. But the wreckage of civilization can become a playground for geniuses and artists, and we need it to be. "Silver and Water" continues the legacy of reinventing landscapes from the industrial ashes begun with her "Not a Cornfield" project, which sought to reimagine and repurpose a 32-acre industrial brownfield in the historic center of L.A., and was exhibited at Eastman House in 2007. As time moves forward, the artist and her team unravel more and more connections between our use and abuse of vital resources. Bon has found more links between silver and water as chemotherapy treatments for industry-created cancers that plague humanity. She connects our misuse of natural resources to our abuse of another powerful American resource: the members of the military who are forgotten by the nation. 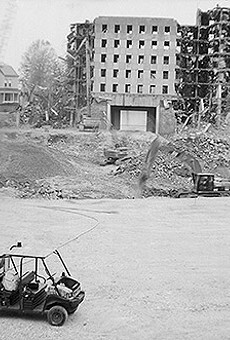 Bon's interest in the plight of veterans is documented in prints that record the symbolic raising of a giant flag on Veterans Day, and the demolition of a building at Soldier's Home in D. C., caught by the Liminal Camera in the moment when a fallen wall reveals an old silver screen within the structure. Bon believes that in the future, the reason for Rochester's original boom will make it a crucial place once again. But our nearby river and lake are currently polluted, and the energy-gathering infrastructure at High Falls, which has such potential for our city, has been sold to a foreign company. We stand in dubious territory, amid silver-tongued bureaucratic battles over regional fracking, and whether Rochester might store that process's wastewater, which could leech into our own waterways. Artists such as Bon prompt us to question the value of moving forward with short-sighted industries, and to ask who the beneficiaries are in the short and long runs.